When your child has a fever, you know what it's like to wait it out. 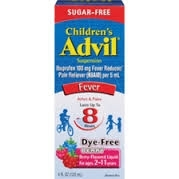 Children's Advil® Suspension reduces fever fast* – even faster than Children's Tylenol®. It lasts longer*, too – up to 8 hours with just one dose. And Children's Advil® also relieves aches and pains. Use this product only with chart provided. Find right dose on chart below. If possible, use weight to dose; otherwise use age. Measure dose with cup provided. Do not discard the measuring cup. Repeat dose every 6-8 hours if needed. Do not use more than 4 times a day. If stomach upset occurs while taking this product, give with food or milk. If under 24lbs.. or under 2 years of age consult a doctor. If 24-35lbs.. and 2-3 years of age: 1 teaspoonful. If 36-47lbs.. and 4-5 years of age: 1 1/2 teaspoonfuls. If 48-59lbs.. and 6-8 years of age: 2 teaspoonfuls. If 60-71lbs.. and 9-10 years of age: 2 1/2 teaspoonfuls. If 72-95lbs.. and 11 years of age 3: teaspoonfuls.